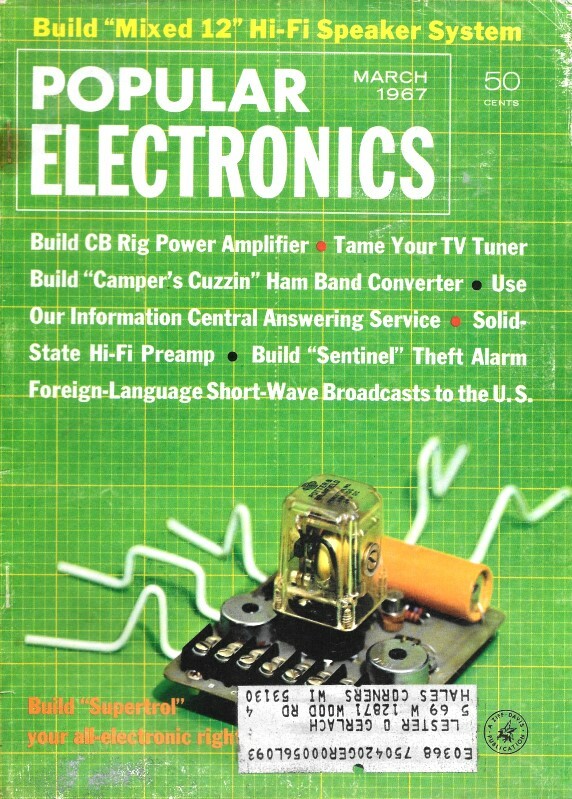 If you have never seen an old-fashioned television tuner - particularly a color TV tuner - you have missed a truly impressive bit of electromechanical ingenuity. I include it here for you to marvel over, not because you are likely to need the information (although some RF Cafe visitors still use and/or service such things). 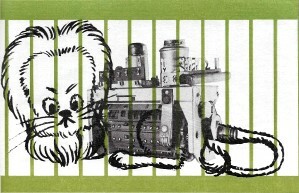 Unlike a simple parallel plate capacitor tuner used by many radios, the TV tuner contains inductors, capacitors, resistors, tubes (or transistors), and many switch contacts (which provide ample opportunity for intermittent or no electrical contact when they inevitably get dirty). If a radio is a multi-band job, it nearly always has a separate switch or switch bank to select a particular band. The band switches place a different set of inductors and capacitors in a resonating tank circuit along with the common main capacitor tuner. Fig. 1 - Exposed turret tuner contacts are easy to clean. The detent should work easily and in a positive manner. Fig. 2 - Touch these coils only at the risk of detuning the channels. Cleaning the water-switch contacts presents a challenge, but it can be done. Fig. 3 - Modular-type construction on some sets permits easy access to the tuner without the need to pull the chassis. In this case, you don't even have to disconnect any of the leads going to the tuner. Fig. 4 - To remove the shield, depress the lip with your thumb. It is possible to get to the tuner on many sets without removing it from the TV chassis. Fig. 5 - Use a cotton swab or a piece of cloth dipped in tuner cleaner to make the tuner contacts shine. Rotate the drum to expose the hidden channel strips. Fig. 6 - Depress the channel-strip retainer to release the strip. Remove about five or six sections to get at the spring contacts. Each one is numbered in sequence and should be replaced in proper order. Fig. 7 - Be careful not to distort the setting of the spring contacts. These contacts can be reset, however, if necessary, by applying a little extra amount of pressure in the appropriate direction. Fig. 8 - Smudged channel strips are a sure indication that the spring contacts are riding on the plastic strips. Raise the contacts to clear the plastic, but not enough to miss the contacts on the strip. If you have to jiggle the channel-selector knob on your TV set to bring in a program, or if the picture and sound conk out again just as the good guys are shooting it out with the bad guys, it's a good bet that your tuner needs a cleaning. When the many dozens of silver contacts in a tuner become tarnished and dirty from exposure to the atmosphere, they make intermittent and poor electrical connections. Connections can become so bad that the slightest vibration will cause the picture to flash on and off. Tuner contacts, whether on black-and-white or color TV sets, require frequent cleaning. How often a cleaning is needed depends upon the environment and to some degree upon the way the TV set is used. Tuner design and type of contacts also affect the length of time between cleanings. Cleaning tuner contacts can be costly. Service shop charges of $5 are not unusual if the set is brought into the shop. Charges run higher if a serviceman is sent to the home. Of course, rates vary. Don't put off cleaning the contacts if you have to "shake well" before using your set, for chances are you are going to jiggle something loose and do damage. Types Of Tuners. Disregarding the electrical characteristics, but considering the mechanical aspects, there are basically two types of tuners in general use that have a large number of contacts. 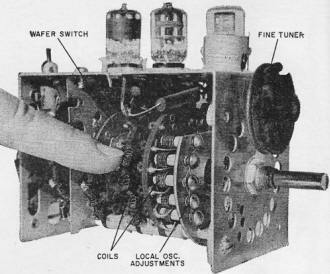 The turret-type tuner (Fig. 1) takes the prize for the largest number of contacts. 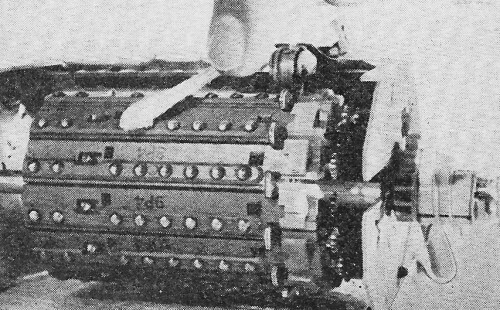 The wafer-switch type (Fig. 2) has more hidden nooks than you can shake a cleaning cloth at. 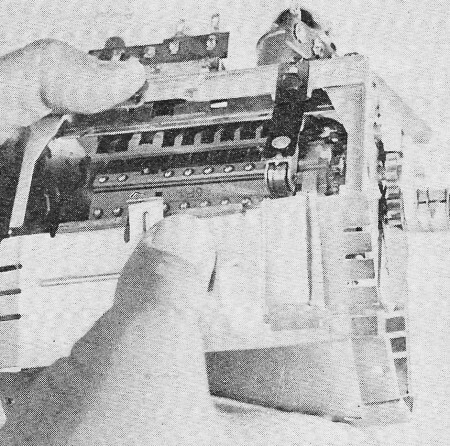 The turret tuner has a separate plastic strip for each channel. 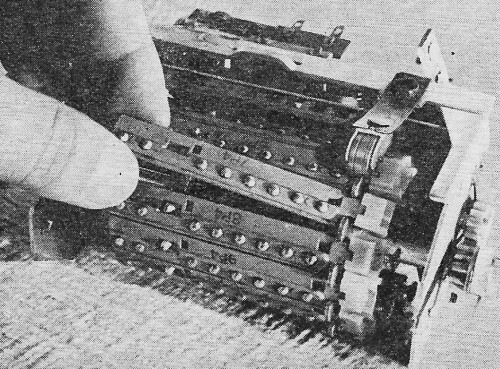 Each strip has a separate set of coils which is connected to a set of fixed half-round contacts. The strips are arranged in a turret-like manner. 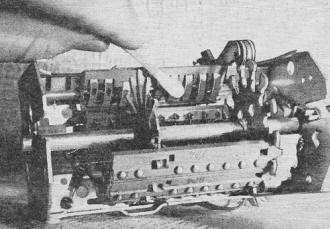 The turret can be rotated to bring one strip at a time into position, in line with a set of spring contacts. 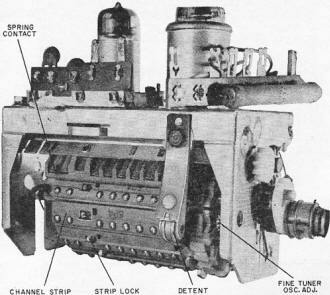 Unlike the turret tuner, the wafer-switch tuner has a set of coils connected in series on each wafer and, depending upon the channel selected, more or fewer coils are switched into each tuner circuit. The rotary switches "pick up" the correct number of coils for each channel. For instance, Channel 13 requires only one coil on each wafer, whereas all the coils are "alive" for Channel 2. Warning: when you clean the tuner contacts, do not bend, twist, straighten or adjust any of the coils on the tuner; do not loosen, tighten or adjust any of the screws on the tuner; do not change the position of any components or leads inside the tuner; do handle the tuner gently. Exposing The Tuner. Always a formidable task for a neophyte (and even for a pro so far as some sets are concerned) is the job of pulling the chassis out of the cabinet to get at the tuner. If you never pulled a chassis, and if you have any doubts about your ability to do so, the best advice you can follow is to keep your hands off the set. You can do a lot of damage. But some sets have tuners that are easy to get to; unitized construction permits tuner removal for servicing in a matter of minutes. See Fig. 3. Remove the U-shaped metal cover by depressing the lock until the projecting lip clears the tuner chassis as shown in Fig. 4. Dull, discolored contact surfaces showing thin black streaks reveal a definite need for cleaning. Cleaning Turret-Type Tuners. Clean away the tarnish by wiping each contact with a cotton-tipped swab, or other suitable piece of cloth, lightly moistened with a cleaning solution, as shown in Fig. 5. Rotate the turret to expose all of the strips. Polish the contacts thoroughly, until all evidence of the cleaner disappears. When all the rotary contacts are clean, carefully remove about five or six strips as shown in Fig. 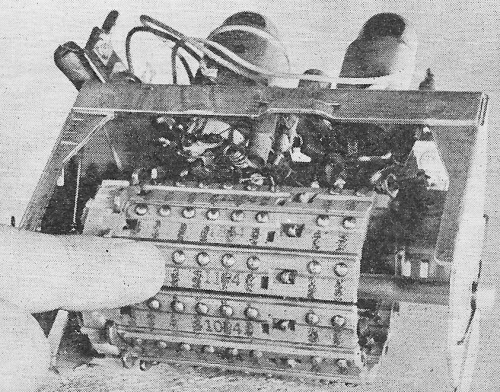 6, and rotate the turret until the spring contacts are accessible, as shown in Fig. 7. Clean these contacts carefully. Do not exert enough pressure on the spring contacts to cause them to come to rest at a new angle. These contacts must be properly positioned. If they are too deeply recessed in their slots, they won't make contact with the contacts on the channel strips. If the spring contacts project too far out of their slots, they will ride on the plastic strips and smudge up the strips as well as the contacts so badly that you'll wonder where the yellow went. (Some plastic strips are yellow.) See Fig. 8. You can check the position of these spring contacts by observing their action as you rotate the turret. The springs should rise and fall as the contacts on the strips pass the springs. If any of the springs do not rise, gently and judiciously pull them down just enough to reset them in a lower position. Recheck the action after an adjustment is made. It's a good idea to check out the action for all channel strips just in case there is an out-of-round condition which requires a touch-up adjustment. Of course, you should also check to see that the springs are not set low enough to touch the plastic strips. Don't overlook the detent - it centers and holds the turret on the selected channel. The detent should be free-acting, clean and lubricated. Lubriplate or other similar lubricant can be used. Do not disassemble the detent if it is in working order. After you have cleaned the tuner and are satisfied with the mechanical action, you can "button it up." Cleaning Wafer-Switch Tuners. Because of their concealed type of construction, wafer-switch type tuners are more difficult to get into. In a great many cases you can rely on the wiping action of the contacts to do the elbow work on a cleaning job. Try wiping the rotary contacts with a pipe-stem cleaner, soaked in a cleaning solution, as you rotate the tuner shaft. In many cases you have to rely on the rotating contacts to carry the clean­er around to the inaccessible stationary contacts. Spray cleaners are handy to get at the "buried" sides of the switches, but you should avoid spraying anything except the contacts. Some of the sprays can detune your tuner, especially while they are still wet. If you find a few misplaced channels after an indiscriminate spraying job, you will have to "dry" out the tuner. Most sprays, particularly the aerosols, dry out by themselves. Choosing A Cleaner. Most electronic supply houses stock general-purpose contact cleaners in 2-oz. bottles that sell for about 50 or 60 cents. If you elect to use such a general-purpose cleaner, follow up the contact-cleaning operation with a light, filmy application of silicone lubricant. There are special-purpose tuner and contact cleaners in various types of packaging, ranging from eye-dropper bottles to aerosol spray cans; prices range from less than a dollar to more than three dollars. The aerosol spray cleaner, consisting of carbon tetrachloride, trichloroethane, or other chlorinated hydrocarbon solvent, washes away foreign matter under the pressure of freon propellant. Freon, containing no active properties, evaporates thoroughly. Most tuner cleaners deposit an extremely thin film of silicone lubricant that guards against future contamination.